Buxton team currently has one search dog and handler. It has been calculated that a dog is equivalent to about 20 searchers in good conditions and many more in poor conditions. The dogs are trained to ‘Air Scent’ rather than track the missing person. Air scenting is a very efficient method of searching large areas quickly and does not require items of clothing or effects of the missing person. In ideal conditions a dog can pick up a human scent from about 500 metres. The dogs react to a human scent being blown towards them by wind or air currents. They work equally well in the dark or in poor visibility and use their senses of smell and hearing to their fullest under these conditions. If there is no wind or it is storm force human scent will not carry as far, and the handler compensates by shortening the blocks of area swept. We use Search Dogs primarily for locating missing hill walkers or climbers. Our dogs are also deployed to assist the Police in searches for missing persons, such as children, the elderly and confused, or victims of crime. All handlers are trained in the protection of crime scenes. This BBC article and audio interview of Buxton dog team, Zak and Nick, might interest you. Sadly, Zak died towards the end of 2012. Nick however, is now immersed in training a puppy, this time as a trail dog. Check out the SARDA website for more details. 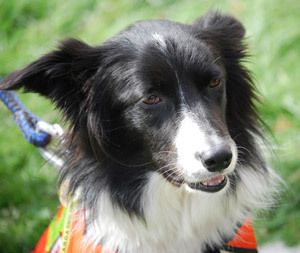 Megan graded to novice search dog status in June 2007 and upgraded to full search dog in January 2009 at the early age of 4. Megan can often be found licking anyone who’ll tolerate it.